Apprehensive About 'Apprehensions' (And 'Crisis' And 'Record') : NPR Public Editor Listeners and readers raise concerns about the language used to talk about what's happening at the Southwestern border. 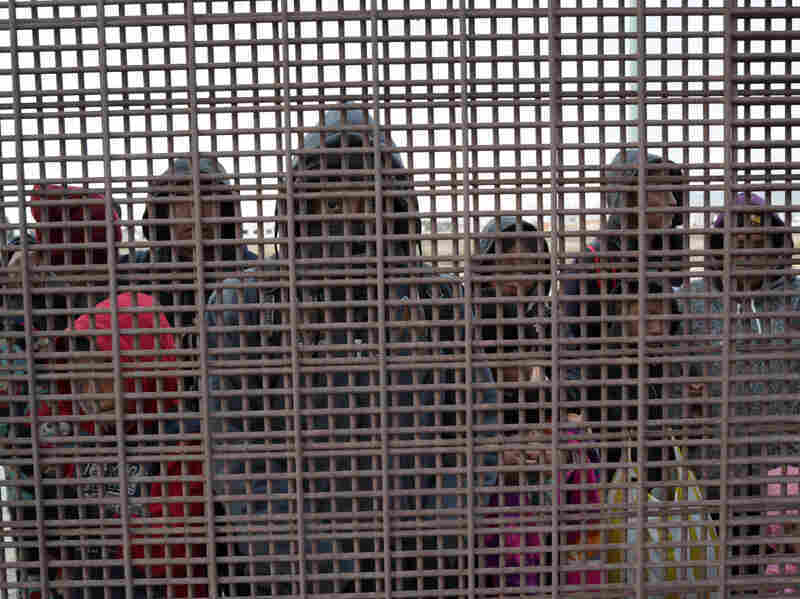 Central American migrants stand at the U.S.-Mexico border fence in El Paso, Texas. The migrants turned themselves in to U.S. Border Patrol agents, seeking political asylum in the United States. The language used to describe immigration is one of the most common topics of concern when we hear from NPR listeners and readers. That's no surprise, really, given the rapidly evolving nature of what is happening at the Southwest border and the way some words ("crisis" and "illegal" come to mind) have been marshaled for political ends. Advocates on both sides of the immigration issue want to paint the situation in stark terms for their own purposes. But, of course, that's not NPR's role. Its reporting should (and does) strive to present the information as factually and fairly as possible, so listeners and readers can make up their own minds about the issues discussed. The word "apprehensions" (and its verb form, "apprehended") is one word sparking some recent debate. When U.S. Customs and Border Protection releases its monthly reports about the number of migrants they are processing at the Southwest border, the official statistic is referred to as "apprehensions and inadmissibles." NPR has used the term "apprehended," rightly, going back many years, when talking about those arrested trying to enter the country illegally. Some readers and listeners have questioned whether it is the best word choice now that the nature of those "apprehensions" has so substantially changed in recent months. Here's an explanation of what NPR is referring to when the word is used, and thoughts on some more precise language. Webster's New World College Dictionary, Fifth Edition (NPR's dictionary of record) defines "apprehend" as "to take into custody; capture or arrest." That's what I think an average listener or reader would understand when reading that, say, "The number of migrants apprehended at the border last month surpassed 103,000 — the highest level in more than a decade." The "capture" part of the dictionary definition conjures up an element of someone trying to escape, to run away. But increasingly, that's not what's happening at the border. Nor does the 103,000-plus number actually reflect only "apprehensions;" it also includes what the government describes as "inadmissibles" (see below). According to NPR's reporting team covering the issue, many migrants are crossing the border somewhere other than an official entry point and then presenting themselves, often in large family groups, to border agents and requesting asylum (though the percentage of the total requesting asylum is not included in the monthly report). Is it accurate, then, to describe these people as having been "apprehended," a word that also implies attempting to evade the law? LEHRER: By the way, the technical term for being taken into custody at the border is "apprehended." That's what's on the official government sites. So when I did those stats and looked all the way back to 2000, that's what they call it: 'apprehensions at the border.' But is that even an accurate word for what's happening today? Aren't so many of these people coming to give themselves up so they can enter the asylum process? SACCHETTI: Well they are... they are a majority — I mean, most them ... the bulk of them are families, parents and children or aunts and children, grandmothers and children. And they, they are surrendering in large groups — some as large as 300 people. And it's ... it's such a dramatic change. I mean, there are still single people adults sneaking in on their own and trying to avoid immigration authorities. But the border now is set up so well to detect them and to deport them that they're often apprehended also very quickly. A much smaller number of migrants are presenting themselves at official points of entry and requesting asylum. Those migrants are included in the totals, but as "inadmissibles." For the month of March, the figures were 92,607 "apprehensions" and 10,885 "inadmissibles." The total is the 103,000-plus number. I'm not sure that most listeners and readers would hear "apprehended" and realize what a vast range of actions that encompasses. While shorthand is always tempting to journalists trying to describe the big picture and get to the meat of policy questions, more precision in this case would help NPR's audience better understand the complicated border dynamics. I like the way this Vox article referred to the broad number: as people who "tried to enter the US without valid papers." As an alternative to "apprehended" or "apprehensions" alone — at least while the current trend of asylum-seekers turning themselves in to authorities persists — I like the way the digital version of this NPR story puts it, talking about people who were "apprehended or surrendered." Another good option would be to say these people had been "taken into custody." Laura Smitherman, an NPR deputy national editor who has been overseeing the border coverage, suggested "unauthorized border crossings." And Mark Memmott, NPR's standards and practices editor, suggested that, "maybe 'detained' is often best because if you are apprehended or you surrender you're going to be detained for at least a while." Most of the people CBP counts in its data are listed under the heading "apprehensions." Don't simply say, then, that those who have crossed the southern border and been detained have been "arrested." Not everyone has been, or will be, charged with a crime. The best practice is to use "apprehended" or "detained" as the action words when reporting broadly about what is happening to people. Save "arrested" for those times when we drill down into the data. When reporting on the recent surge of migrants, many of whom are seeking asylum, there are two categories. As mentioned, the biggest category is migrants who are apprehended after crossing the border between official ports of entry without authorization. The second category is migrants who presented themselves at ports of entry without documentation and were deemed "inadmissible." When referring to the total (the two categories added together), we should say more than 100,000 were "taken into custody" or "detained," and we can refer to the migrants as "unauthorized." "Apprehensions refers to the physical control or temporary detainment of a person who is not lawfully in the U.S. which may or may not result in an arrest." But is it a record? Hogan Gidley, White House principal deputy press secretary, was a guest on Sunday's All Things Considered, where he referred to people "pouring into this country in record-setting numbers — 100,000-plus just last month alone." Again, that number he cited actually includes some people who asked to be admitted and were deemed "inadmissible." As for it being a record, it is — if you go back just one decade. As NPR has reported, the 103,000-plus number reported for March was "the biggest monthly total in more than a decade," and officials are expecting a much higher total this month. It's also a record number of families. But go back to 2000 and the number looks quite different in comparison. In fiscal year 2000, more than 1.6 million people were apprehended, NPR has reported; that works out to a monthly average of more than 130,000. Want to be more confused? The number of border "apprehensions" (303,916) in fiscal year 2017 (ending Sept. 30, 2017) was the lowest since 1971, making the surge of recent months even more striking (another 111,601 "inadmissibles" were reported in fiscal 2017). Does the current number of people seeking to cross the border represent a "crisis," as the Trump administration has said? That's a word many listeners and readers have objected to as taking the administration's side on the issue. Others on the opposite side of the political spectrum also have used the word, and I certainly think it's supportable, given NPR's reporting on how immigration authorities and social service providers at the border have been overwhelmed by the number of families needing help. How to talk about "illegal immigration"
- The debate is still about "illegal immigration" and what to do about it. "Illegal immigration" remains an acceptable term when we're reporting about the issue. - When we're reporting about the people at the center of this story, it's still best practice to begin with action words, rather than labels. Two examples: They are "in the country illegally" or have "entered the country illegally." - "Undocumented" is also OK in headlines. The word "illegal" always sparks email from listeners. Under both U.S. and international law, migrants who ask for asylum at a port of entry are not committing an illegal act. As the U.S. Citizenship and Immigration Services website notes, "You may apply for asylum regardless of your immigration status, whether you are here legally or illegally." But the act of crossing the border without papers, even if the intent is to ask for asylum, is illegal. Those are two different acts, which are often conflated. Immigration is one of those issues that has become so heated that people read and hear the same words differently. The border situation is also confusing, so the language should be as clear as possible. Juliette Rocheleau contributed to this report.